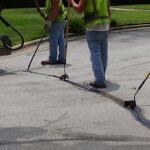 Hot rubber crack sealer is an effective remedy for full depth reflective pavement cracking, and should be part of every maintenance program. Crack sealing should be performed prior to “cold” overlay process to minimize reflective cracking from the substructure, and to provide protection from moisture intrusion if cracking occurs. 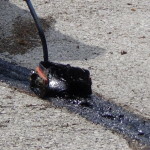 Our hot rubberized crack sealing services are available year round. We use hot air injected into industrial blowers to remove debris and dry cracks which insures sufficient bonding.